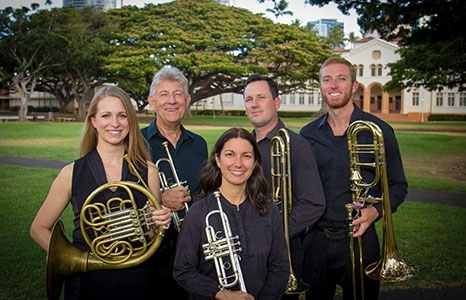 The Honolulu Brass Quintet presents myriad compositions and arrangements, showcasing the ensemble’s majestic and versatile sound. The varied program includes: DiLorenzo’s Fire Dance, Bach’s Little Fugue in G minor, Schütz’s Ride La Primavera, De Wert’s Vezzosi Augelli, Tovey’s Santa Barbara Sonata, Schuman’s American Hymn, and Thomson’s Family Portrait. This event is presented by Chamber Music Hawaii.